World of Snorecraft - I created a Processing app that creates art while you sleep, based on accelerometer data from your phone. Make it Soft - I cross-stitched a QR Code that led back to task when you scanned it. Fun with food - I connected a Makey-Makey to some different types of food and then created a simple Cockney rhyming slang Scratch program. My SF0 profile, where you can see my other task completions. I have participated in NaArMaMo (National Art Making Month) twice so far, and intend to participate again in August 2014. The aim is to make one piece of art a day, and not care too much about the quality. Space Invader card - A pop up space invader card that has LED eyes. 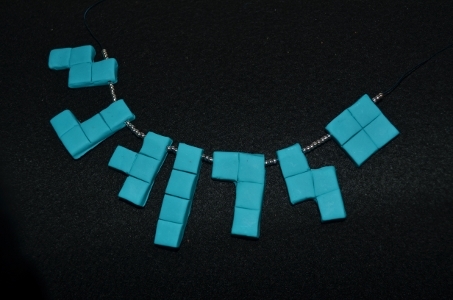 Tetris necklace- Made of Fimo. Glowing necklace, which uses a light dependent resistor. Sundial for SF0: Sundial task. I'm participating in NaArMaMo again this August, so planning to try to make a piece of art every day again. This page was last modified on 18 July 2014, at 15:54.